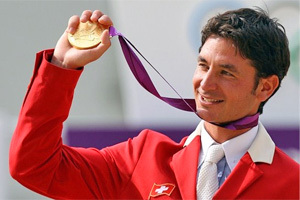 The British and German stranglehold on Olympic equestrian medals has been broken in the individual Olympic showjumping final at Greenwich Park, with Switzerland’s Steve Guerdat claiming gold at London 2012. Guerdat was the only rider in the final competition to maintain a completely clean sheet in the two rounds, and in a thrilling two-way third-round jump off, The Netherlands’ Gerco Schroder pipped Ireland’s Cian O’Connor for silver. Hopes had been high for a fairytale British ending to a week of fantastic jumping sport, but it wasn’t to be. And it was a very last-minute affair for O’Connor who only made the cut when Rolf-Goran Bengtsson’s stallion, Casall, was withdrawn after being sent to the holding box at the final veterinary inspection. This allowed the three riders sharing reserve spot to take their chance, and the Irishman grabbed the opportunity with both hands. Despite being just second into the ring as Wednesday’s action began, O’Connor produced a copybook run with Blue Loyd to suddenly place himself very firmly in contention. O’Connor bought the 12 year-old gelding Blue Loyd only last year, and was narrowly outpointed on Monday in the third qualifier for the final, with a total of 20 faults on the board. But this was high enough to put him in joint first reserve position for the final, and when Casall was withdrawn, the Meath rider took a slot for the last two rounds. As first reserve O’Connor tied on points with Argentina’s Jose Maria Larocca and Belgium’s Dirk Demeersman, and under Olympic rules all three went through to the final. Brazilian star Rodrigo Pessoa described Bob Ellis’ finely crafted first-round 12-fence track as “very horse-friendly and not too hard”, but only five more found the key to it and the 2004 Olympic champion wasn’t one of them. He was one of many to be penalised at the open water at fence eight, which came off a left-hand turn from the previous vertical and claimed 10 victims from the starting field of 37. The questions began quickly with the double of water-tray oxers at fence three requiring real control after the previous triple bar, while the line from the oxer at four to the 1.60m planks at five proved tricky, several clipping the front candy-striped rail of the oxer. Some struggled to regain control on the ride from the water to the following oxer at fence nine, but it was the penultimate triple combination that was the first-round bogey, a total of 12 horses leaving at least one element of this on the floor before running down to the final 1.60m planks. The last three to go in the opening round had been flawless until the final round, and while The Netherland’s Maikel van der Vleuten retired after Verdi had two fences down and Marc Houtzager’s Tamino clipped the middle element of the triple combination, the British dream was still alive that Monday’s team gold medallist, 54-year-old Nick Skelton, could add the individual title. As round two began, Skelton (Big Star) and fellow team gold medallist Scott Brash (Hello Sanctos) shared a zero scoreline with O’Connor, Frenchman Olivier Guillon (Lord de Theize), Guerdat (Nino des Buissonnets) and Germany’s Marcus Ehning (Plot Blue). On the new track, the triple combination at fence seven proved hugely influential, and Guillon disappeared from the reckoning when leaving the middle and final element on the floor. The first part of the double at four fell for Brash, and Ehning’s chances were dashed when Plot Blue clipped the white planks at six and the oxer at eight on the 10-fence course. The German rider described his round as “extremely annoying, the first round was really great. And then I was too cautious at the vertical (planks). After the rail down we both lost concentration,” he said. The crowd went wild as Skelton returned to the ring for a second time, Guerdat already holding the whip hand with his second fabulous clear from his 11-year-old gelding. O’Connor was close behind when picking up just one time fault which left him level with Schroder who followed a first-round time penalty with a flawless second effort that kept him right in the game. A clear from Skelton would have forced a jump-off for the title and his every move was greeted with gasps of excitement, but when the oxer, three from home, hit the deck the Swiss rider already had gold in the bag. Skelton said, “I was a bit unlucky. Everyone thought it was going well, I did too, but I just touched the pole at the wrong time and that was it. I feel sorry for the people that came today. We expected to win and it wasn’t to be. But we got one gold, we would have settled for that before we came,” he added. Guerdat’s individual gold is the first for Switzerland in 88 years, the last claimed by Lt. Alphonse Gemeseus and Lucette at the Olympic Games in Paris in 1924. It was quite a moment for the 30-year-old rider who was just edged out for the honours in the closing stages of the FEI World Cup Jumping Final three months ago. “But that was an important step to this medal,” he said. “He (Nino des Buissonets) had a big break after the World Cup and just four shows before he came here. I wanted to keep him fresh and confident. I know I have a freak of a horse under me and I knew that if I took time with him it would be easier when he came here,” he said. For Schroder, the silver medal is very timely indeed. At the FEI European Championships in Madrid (Spain) last autumn he had individual gold in his grasp until dropping two fences in the very last round. The Olympic medal is just reward for the man who bought his 10-year-old stallion five years ago. “We thought it would be fun to call him London, and I had a great feeling with him from the start but I didn’t know I would win two (Olympic) medals here – it has worked out very nicely!” said the man who also collected team silver last Monday. O’Connor’s success is the most remarkable of all, as he only got a last-minute call-up for the Irish team with the horse he specifically bought with London 2012 in mind at the end of last year. Formerly ridden by Finland’s Nina Fagerstrom, the 12-year-old Blue Loyd has a reputation for being a bit of a tearaway, but as the Irishman said “he may not be big but he has a huge heart and is unbelievably brave. Lots of people questioned his scope and wondered if he should be here – I think he’s answered that question,” said the rider whose own personal journey since winning, and losing, the individual gold medal in Athens eight years ago has sometimes been a bumpy ride. “Coming off Athens it is great to get here and deliver on the world stage,” he said. “It’s something special to give back to the Irish public. It’s a proud day for me and all involved with me,” he added after clinching Ireland’s very first medal of the London 2012 Olympic Games. Guerdat also complimented his support-team, adding: “I love what I do, I love riding whether I’m competing five and six year olds or here (at the Olympic Games). I had a goal to be here one day, it’s a dream come true,” he said. He has shown promise since winning the bronze medal at the Swiss National Championship at the age of 17. This is his third Olympic Games. This committed and ambitious rider, who is so often hard on himself when things don’t go just right, has shown that hard work and determination pay off in the end. That theme has been consistent for equestrian athletes throughout the London 2012 Olympic Games. IOC President Jacques Rogge was part of an IOC delegation enjoying the Olympic jumping individual final at Greenwich, and the arena was buzzing with excitement throughout the competition, as were the motor-drives of the more than 130 photographers who were on-site to record it all for posterity. There were so many spectators trying to call their friends after the competition that phone communication collapsed for a short period. Once again the atmosphere was electrifying, and there will be plenty more electricity in the air as the Freestyle brings dressage to a close on Thursday afternoon. Freestyle action begins at 12.30 local time when Italy’s Valentina Truppa and Eremo del Castegno are first into the arena, while Great Britain’s Charlotte Dujardin and Valegro, hotly tipped to take the individual title, will be last of the 18 horse-and-rider combinations to compete. 37 horse-and-rider combinations started in the first round of the London 2012 Olympic Games jumping final. Under normal circumstances just 35 would have qualified, but due to the withdrawal of Rolf-Goran Bengtsson’s Casall in the holding box during the final horse inspection the three riders sharing 38th spot squeezed in – Argentina’s Jose Larocca (Royal Power), Ireland’s Cian O’Connor (Blue Loyd) and Belgium’s Dirk Demeersman (Bufero van het Panishof). These three started first in today’s opening round. There were 12 fences on the first-round track. 20 nations were represented in the final – Argentina, Ireland, Belgium, Urkraine, Sweden, France, Australia, Portugal, Belgium, Japan, USA, Brazil, Germany, Mexico, Canada, Switzerland, Great Britain, Netherlands, Saudi Arabia, Colombia. There were 6 clears in first round. In the first round the bogey fence was the open water at fence eight – 10 horse-and-rider combinations faulted here. A total of 5 mares, 5 stallions and 12 geldings competed in the second round. 22 lined out in the second round over a new 10-fence course of fences.